Founded in 1930, Bullis School is an independent coeducational college preparatory day school for students in grades 2-12. A total of 765 students are enrolled, including 473 in the Upper School, grades 9-12. In 2014, 119 students graduated. Located in a suburb of Washington, D.C., Bullis admits students who will contribute in the classroom and throughout the community and who will embrace the school’s participatory approach. Students balance academics with arts and athletics, along with activities that encourage students to pursue their passions and discover new skills and interests. The school’s approach is framed by our core academic values: communication, critical thinking, creativity, collaboration and resourcefulness. From a challenging college preparatory education to a full array of performing groups, athletic teams and student service clubs, Bullis provides students with the chance to learn in the classroom and art studio, and on the playing field and stage. While preparing students for college, the Upper School also requires students to participate in two school sports or extracurricular activities each year, which further cultivates personal growth and helps students to develop or refine interests and passions. In addition, advisory groups and other events throughout the school year focus on character development to round out the skill set that Bullis graduates take with them when they leave the school. Bullis students work hard, successfully juggling academic demands with athletics, arts and other extra-curriculars. Upon graduation, our students are prepared not just academically— they have gained the strength of character and confidence to succeed in college and beyond. 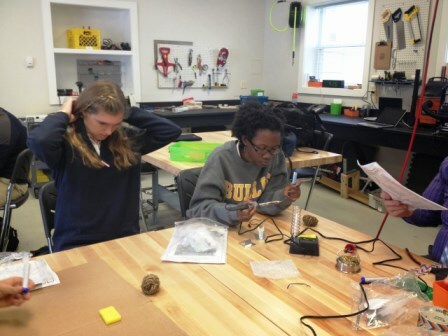 The Bullis maker space was created through grant funding in the summer of 2014 by converting an existing space, the facilities workshop, into a tinkering classroom. It is approximately 1000 square feet and is comprised of two rooms: a workshop and digital design lab. Both spaces were built with a wide span of ages in mind as our school begins in grade 2 and ends in grade 12. There are taller workbenches and stools where the older students work as well as smaller activity tables primarily used by lower schoolers. The workshop contains workbenches that can be easily moved as needed to maintain flexibility in the space and allow for a variety of collaborative groups and project sizes. Lining the walls are built-in workbenches for more heavy- duty work. Storage is at a premium so in addition to shelving and wall units, we have recently added a loft to store some of the larger supplies and project. The the workshop space is divided into the following areas: vinyl cutting, laser cutting, CNC routing, soldering and sewing while still leaving a lot of flexibility in the center for more mobile activities ranging from LittleBits, science labs or robotics. The Design Lab houses computers for a variety of activities: programming in robotics (Robot C), work with micro-controllers and other electronics, and design using programs such as Illustrator and CAD. This room also contains a 3D printer as well as equipment for ham radio operating as Bullis acquired an FCC amateur radio license a few years ago. A highlight of the maker space is the easy access to the outdoors through an existing garage door that students painted with whiteboard paint for students to use to brainstorm and hash out ideas. Outside is a small work area where students can perform tasks involving large, unwieldy or smelly items and students enjoy the fresh air in the warmer weather. Students frequently find ways to improve the space and have built a mobile whiteboard, created signage and posted instructions, and solving simple problems such as dripping soap in the wash sink. We encourage this practice and look forward to new student additions! Attendance taking candy machine: Programming a Raspberry Pi and careful engineering, a team of upper school students gave this project a good shot… it is documented and ready for pick up by a new team (the machine will also learn your favorite candy! Student versus Faculty chess board: a team of upper school students in the Modern Problem Solving class 3D scanned teachers and students using a Kinect and now need to 3D print the figures. They have plans to use the laser engraver to create the chess board. We feel as though we are just scratching the surface of how this space can be utilized by our community – but first we need to do more outreach, both on our campus and off. We’d love to learn from others with regards to how they use their tinkering spaces, collaborate on projects and engage with our local community for authentic projects. Within our Bullis community, we wish to get more teachers involved with projects in the maker space, whether they are for a class or on their own. Those who are primary users of the maker space are exploring maker popups around campus during breaks and study halls and more maker programs for students and staff. This summer, we will be offering a maker camp which we hope to expand into after school programs for our students. We wish to create more specific maker curriculum to embed possibly in other courses – branch out beyond STEM and the arts. A part of this would include the development of a stronger badging system to learn and share maker skills and and encourage staff in the community to tinker as well! We would love to chat with other schools and learn from you! Please contact Faith Darling (faith_darling@bullis.org) if you want to collaborate or share ideas.